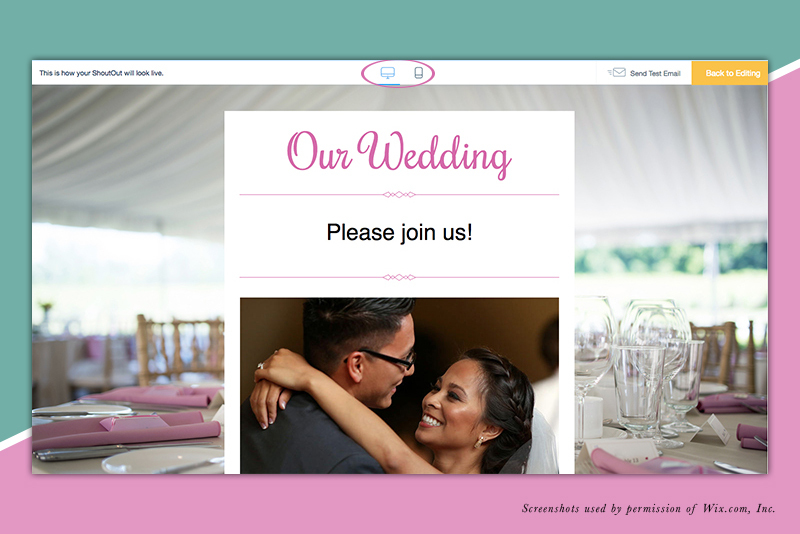 In the previous tutorial, we started our ShoutOut E-invitation for our wedding website. We customized the background image and added another image of the bride and groom. Now we can work on the Our Wedding text. Select the Our Wedding text and click the Edit icon. As you can see, we can customize the Format, Font, Size, Style, Color and even add a link to the text. Choose a font from the list and click Apply. Now let's change the text divider to something more delicate. Select the divider and click the Edit button. As you can see, we can change the Shape, Fill Color and Opacity. Let's change the color to match the napkins in our background image. Repeat the previous step for the other text dividers. Let's change the text between the top two dividers. Select the text and click the Edit icon. Change the text to Please join us! As before, use the editing controls to customize the text. Let's keep the date, time and location information displayed under the image. But we can change the font to Helvetica so that it's the same font as the message above. Next, we can change the color of the RSVP button and label text. Select the button and click the Edit icon. In the Settings tab, we can change the button title and change the URL address for the link to go to our Wix Events app on our wedding website. In the Design tab, let's change the button color to match the color of the text dividers. Next, we can change the text and border color to black. Click Apply. Finally, we need to customize the text beneath the button. Select the text to open the Edit window. As you can see, we can change the Address, Phone and Link. We can also toggle these off. Let's do that but we will toggle On the social icons. Click Apply. Now, we can preview our E-invitation. At the top, click the Preview and Test link. On the preview page, we can preview both the full screen and mobile view. We need to add the guest list before we can send our E-invitation. So click the Dashboard link at the top of the page to go back to the Wix ShoutOut Dashboard. There you will see your ShoutOut saved as a draft. When you are ready to send your ShoutOut, go to the Wix Events app and the Invitations section, as before. This time, click the My ShoutOuts button to go to the Dashboard. Screenshots used by permission of Wix.com, Inc.